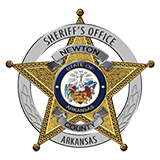 A little after 10:00 P.M. on Christmas night, the Newton County Sheriff’s Office received a call of a shooting near Wayton. The caller stated that after a confrontation his friend had been shot from behind while riding his ATV. The caller was attempting to bring him to the Sheriff’s Office for assistance. A few minutes later, the caller called back and stated that two suspects were shooting at him and his friend again, this time while they were driving in a pickup to the Sheriff’s Office. Shortly afterward, a second caller phoned to report that a pickup truck had rammed into his car and he had fired into the pickup truck as it drove away. Deputies located the first caller and found gunshot wounds to the back of both arms of one of the occupants. Other Deputies, assisted by the Arkansas Game and Fish Commission, located the second vehicle and authorities began working to decipher what had actually occurred. There had been an earlier confrontation when the two friends were on ATVs. As the two attempted to leave the area of the confrontation, two suspects, identified as James Floyd (Jamie) Henderson, aged 37 and Abraham Campbell, aged 32, fired at their backs. Henderson fired buckshot from a shotgun and Campbell fired a rifle. The wounded victim was struck in the back of each arm with buckshot pellets. The victims returned to their house and began trying to get to the Sheriff’s Office in their pickup when a white car with the suspects blocked their route of escape. As Campbell produced a gun from inside the car, the victims tried to drive around them, striking the left side of the car. Campbell jumped atop the car and, after the truck passed, fired two rounds from a rifle into the truck as the victims fled in it. At the same time, Henderson fired at the truck with a shotgun, again as the victims were trying to get away from the situation. All in all, two separate shootings occurred in two locations with Henderson and Campbell being the shooters both times. Each time, they back-shot at the victims as they were attempting to flee. A minor child was in the car with Henderson and Campbell throughout both incidents. Both Henderson and Campbell were charged with two counts of Committing a Terroristic Act and one count of Aggravated Assault. Each had a bond set at $100,000.00. The injured victim was transported to North Arkansas Regional Medical Center where he was treated and released.